hands and feet. 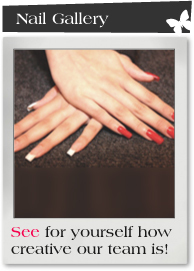 Polished is the flagship EzFlow nail salon for Sussex and Surrey. Polished is open from Monday to Saturday for appointments* between 9.30am and 6.00pm - late night appointments are available by request. If you would like to browse our treatment menu for all the services we have available please click here for price list. We offer all levels of EzFlow education from Intro and Beginner to Advanced Master Artist Nail Technician courses. For more information on all classes please visit our education page here. We pride ourselves on using the best quality products from EzFlow Nail Systems and offer both Orly Professional Nail Polish and the Orly Mini Manicure Range.